March 10, 2013 | David S. Maldow, Esq. The dual monitor collaboration setup is becoming more and more common in standard business meeting rooms. Generally, one monitor will be dedicated to videoconferencing, and the second will be dedicated to basic screenshare. The Mezzanine Conference Room by Oblong takes this basic concept to the extreme, by not only increasing the number of screens in use, but vastly improving their flexibility and usability. The result is a next generation collaboration space capable of producing attention grabbing presentations, as well as increasing the productivity of your working teams. 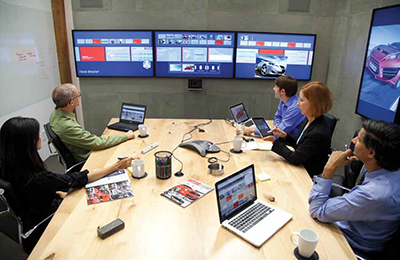 We reached out to David Kung, VP at Oblong, to learn more about the Mezzanine conference room. After all, anyone can hang big monitors all over the walls and call it a collaboration space, so what makes this so special. The answer, as we soon learned, is the intuitive user interface which allows users to effectively use these screens in unexpected ways. Going well beyond basic screenshare, Mezzanine allows presenters and meeting participants to share ideas and collaborate at another level. A collaboration solution has to be drop dead easy. The typical worker already has too much on their plate, and certainly can't take time to develop the professional broadcast editing skills necessary to control a traditional multi-screen medial room. Oblong started with the most familiar business presentation tool, the common slide deck, and built the UI for Mezzanine around that concept. The goal was to create a collaboration room that is as easy to manage as a simple PowerPoint slide deck. The Mezzanine interface at first glance, appears very similar to a typical slide deck UI (please see the video above, starting at 11:30, for a demo of the UI). The obvious difference is that instead of building slides, that get shown one at a time in a deck, you are building views for the various in-room monitors. Another key difference is that Mezzanine UI doesn't require its finished "slides" or views to be shown in a typical linear presentation. Multiple views can switched between multiple screens, allowing for a more fluid presentation and reducing the need to constantly say, "please go back to that other slide". The comparison to slide presentations, while useful to describe the UI, really doesn't adequately explain the Mezzanine's expected uses. The ability to use multiple screens for content simultaneously is just the beginning. Advanced users can really create a lot impact by using their "wand" remote (as shown in the video above) to manipulate images, videos, and other content to create a dynamic multiscreen, multimedia, presentation. While adept wand manipulation may have a bit of a learning curve, new users should be able to immediately share content from any source, on any screen, using the basic UI. "A big part of the value of Mezzanine is that it turns meetings, almost any meetings, into productive work sessions. Often in meetings, people come in, talk, discuss a few issues, then have to leave the room to do additional work that will feed another meeting. With Mezzanine, you can perform that work, right in situ, in the room , in the middle of the meeting, with everyone participating." Smart Mezzanine users will be quick to leverage the "Dossier" feature. This, in effect, "saves" the room in its current state at any given time. Imagine the sales team is using the room, with a list of prospects on one screen, video to the marketing team on another screen, and the new product line spread out on the remaining screens. At the end of the meeting the complete layout is saved to the dossier, which makes it a snap for the meeting attendees to continue where they left off. When another team walks into the room, they load their Dossier and the room is transformed into their workspace, just as they left it. The days of using sticky notes on walls for project management may not yet be at an end, but the era of electronic project management has definitely begun. Today's project teams want to be able to "update their boards" from anywhere. Some management techniques, such as Agile / Scrum can greatly benefit from a digitized version of the project management system being available and manageable on a digital display during "stand-up" project meetings. Ideally, multiple screens can be used to show multiple aspects of a project. A team could have overall status reports on one screen, project responsibilities and details on another, while using yet another as an active workspace, or to include a remote team member with videoconferencing. With all of these resources available, the meeting room stops being a place to talk about work, and becomes the most productive room in the building. The goal was to create a collaboration room that is as easy to manage as a simple PowerPoint slide deck. The Mezzanine interface at first glance, appears very similar to a typical slide deck UI (please see the video above, starting at 11:30, for a demo of the UI). The obvious difference is that instead of building slides, that get shown one at a time in a deck, you are building views for the various in-room monitors. Another key difference is that Mezzanine UI doesn't require its finished \"slides\" or views to be shown in a typical linear presentation. Multiple views can switched between multiple screens, allowing for a more fluid presentation and reducing the need to constantly say, \"please go back to that other slide\". The comparison to slide presentations, while useful to describe the UI, really doesn't adequately explain the Mezzanine's expected uses. The ability to use multiple screens for content simultaneously is just the beginning. Advanced users can really create a lot impact by using their \"wand\" remote (as shown in the video above) to manipulate images, videos, and other content to create a dynamic multiscreen, multimedia, presentation. While adept wand manipulation may have a bit of a learning curve, new users should be able to immediately share content from any source, on any screen, using the basic UI. \"A big part of the value of Mezzanine is that it turns meetings, almost any meetings, into productive work sessions. Often in meetings, people come in, talk, discuss a few issues, then have to leave the room to do additional work that will feed another meeting. With Mezzanine, you can perform that work, right in situ, in the room , in the middle of the meeting, with everyone participating.\"
Smart Mezzanine users will be quick to leverage the \"Dossier\" feature. This, in effect, \"saves\" the room in its current state at any given time. Imagine the sales team is using the room, with a list of prospects on one screen, video to the marketing team on another screen, and the new product line spread out on the remaining screens. At the end of the meeting the complete layout is saved to the dossier, which makes it a snap for the meeting attendees to continue where they left off. When another team walks into the room, they load their Dossier and the room is transformed into their workspace, just as they left it. The days of using sticky notes on walls for project management may not yet be at an end, but the era of electronic project management has definitely begun. Today's project teams want to be able to \"update their boards\" from anywhere. Some management techniques, such as Agile / Scrum can greatly benefit from a digitized version of the project management system being available and manageable on a digital display during \"stand-up\" project meetings. Ideally, multiple screens can be used to show multiple aspects of a project. A team could have overall status reports on one screen, project responsibilities and details on another, while using yet another as an active workspace, or to include a remote team member with videoconferencing. With all of these resources available, the meeting room stops being a place to talk about work, and becomes the most productive room in the building.